The branch of dentistry specializing in the diagnosis, prevention, & treatment of dental & facial irregularities. An orthodontist is a specialist who has completed an advanced education program after dental school, to learn the special skills required to manage tooth movement and guide facial development. A more attractive smile. Reduced self-consciousness during critical development years. Better function of teeth. Possible increase in self-esteem. Increased ability to clean the teeth. Better long term health of teeth and gums. Reduce the risk of injury to protruded front teeth. 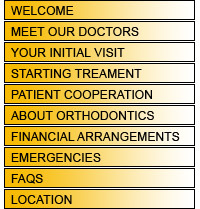 Aid in optimizing dental treatment. Phase I, or early interceptive treatment, is limited orthodontic treatment (i.e. expander or partial braces plus a headgear) before all of the permanent teeth have erupted. Such treatment can occur between the ages of six and ten. This treatment is sometimes recommended to make more space for developing teeth, correction of crossbites, overbites, underbites, or harmful oral habits. Phase II treatment is also called comprehensive treatment, because it involves full braces when all of the permanent teeth have erupted, usually between the ages of eleven and thirteen. Braces use steady gentle pressure to gradually move teeth into their proper positions. The brackets that are placed on your teeth and the archwire that connects them are the main components. When the archwire is placed into the brackets, it tries to return to its original shape, as it does, it applies pressure to move your teeth to more ideal positions. Treatment times vary on a case-by-case basis, but the average time for upper and lower braces is about two years. Actual treatment time can be affected by rate of growth and severity of the correction necessary. Treatment length is also dependent upon patient compliance. Maintaining good oral hygiene and keeping regular appointments are important in keeping treatment time on schedule. The placement of bands and brackets on your teeth does not hurt. Once your braces are placed and connected with the archwires you may feel some soreness of your teeth for one to four days. Your lips and cheeks may need two weeks to get used to the braces on your teeth. Will braces interfere with playing sports? No, however it is recommended that patients wear a protective mouth guard.